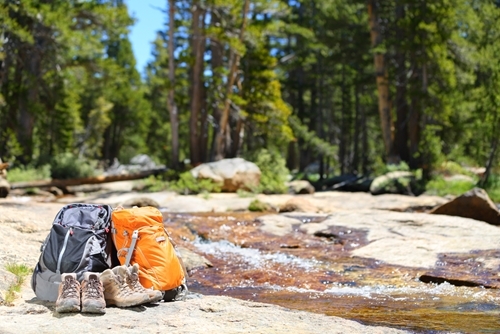 Before heading out on your next hike or outdoor excursion, be sure to pack your day bag or backpack with the right gear. Helpful equipment can go a long way when out on the trail. Hiking is a great way to get out and enjoy the natural world in any season. It is a good form of exercise, and it offers a chance to take in the great outdoors. Here's what you'll need to maximize the experience, as well as stay safe. One of the most important items for any physical activity, a reusable water bottle is key for hikers. Not only is a refreshing sip of water a great way to cool down while on the trail, but staying well-hydrated is important for good health and avoiding fatigue or cramping. Many water bottles are available with built-in filtration systems for any outdoor enthusiasts heading into deep bush, according to Hiking the Smokys. It is unwise to drink water without knowing for sure it is safe to do so, but a good filtered water bottle can help protect you against any water-borne hazards like Giardia. All the same, fill your water bottle at home before heading out. Enjoying a snack or meal is a great activity while resting during a hike and enjoying the scenery. Healthy snacks like trail mix or granola bars are easy to pack and full of protein and energy. They'll keep you fueled while you're on the go and keep your body going. For anyone looking to picnic on the trail, pack light. Sandwiches and other lunchtime standards won't weight you down, and cumbersome Tupperware or packaging will take up space in your pack and be a hassle to lug up and down a path. Even a turned ankle can be a real disaster when out in the bush, which is why bringing a first aid kit is critical for any hiking trip. Things like instant cold packs, bandages and antiseptic medicine can go a long way toward making sure everyone gets home safely. While the odds of anything truly dangerous happening on a day hike are minimal, it is always important to err on the side of caution. Packing light is key when preparing for a day trip, but staying protected from the elements is also important. For that reason, bringing a few key items is advisable. For example, packing a light jacket or rain slicker is helpful for dealing with any inclement weather. Your Pro Trek watch barometer can help you monitor any incoming storms, but regardless, it's worth having a jacket should any rain come through. When the weather is clear, sun protection becomes critical. Sunscreen and lip balm with SPF are important for any hike, even in the woods. Sunburns can still occur in cloudy weather as well. Depending on the time of year and environment, insect repellent might be helpful as well, according to REI. In some regions, mosquitos can carry infectious diseases. Be sure to study up on any danger related to insects before heading out. A day trip likely won't result in an emergency situation, but it is still worth covering all bases. Tell a friend or family member where you'll be hiking and consider packing a few emergency supplies. Bringing along a fire starter or space blanket is a good idea for anyone hiking in especially deep woods or wild areas. Likewise, items like a knife, multi-tool or even duct tape could prove incredibly useful if any unforeseen survival situation presents itself. It may seem trivial, but taking the time to fully prepare for a trip into the bush could prove well worth the prudence. Be ready for whatever trail lies ahead with the tough, solar powered PAG240B-2, complete with Pro Trek triple sensor technology including barometric pressure/altitude, temperature readings, one-touch access to digital compass, and sunrise & sunset data ready to guide you home before dark.